As time goes by, climbing is diversifying itself. Long gone are the days of old fashioned mountaineering in the Alps. Nowadays, moving upwards on rock and ice faces is often a matter of specialism: sport climbing on bolts, ice climbing, bouldering, indoors climbing, expedition climbing, trad climbing, aid routes and so on. Consequently, climbers, equipment, jargon but also destinations have changed and specialised. You wouldn’t go bouldering to Kalymnos or multipitch climbing in Stanage. When climbers make up their minds about their next trip, they would most often choose the style of climbing they want to do and then decide among the best locations for that type of climbing. However, there are still places that offer more than one type of experience and not only in terms of style, but also in terms of history, atmosphere and ethics. The sandstone towers and cliffs of Adršpach and Teplice are definitely one of these places. Before we tell you more about our experience, let us help you with some pronounciation of these somehow complex Czech names. Adršpach is pronounced adr-sh-paCH (with CH being the same as J in the Spanish name Jorge or the ending of the Scottish word loch), while Teplice is pronounced teh-plee-tseh. Not too hard in the end, right? As one may expect, the first ascents made use of the most obvious chimneys and cracks and were nearly free-solos: fixed, man-made protection was introduced only later. 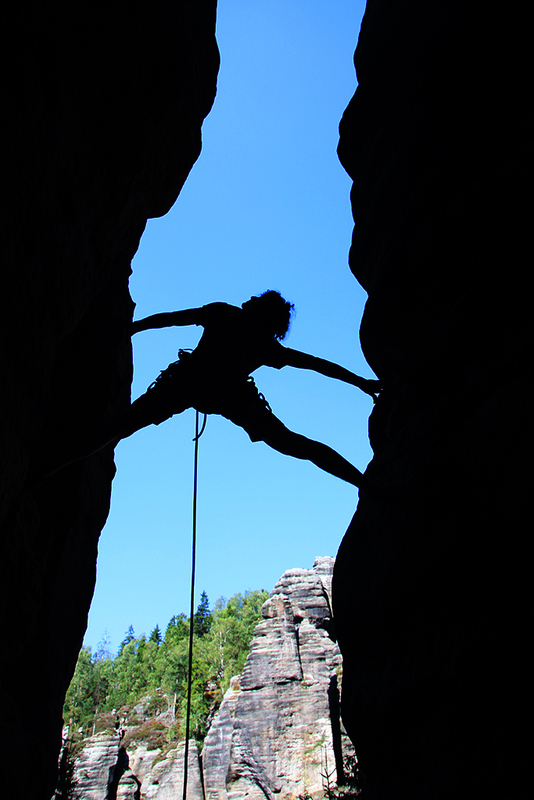 Due to the nature of the rock, the typical-sized pitons were not suitable and metal bolts the size of an ice screw were pounded into the sandstone, ending with a big, solid ring twice the thickness of normal carabiners. 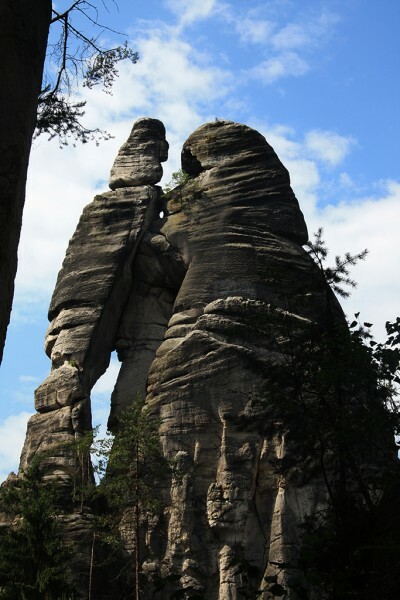 The climbing ethics in Adršpach and Teplice are therefore dictated also by the nature of sandstone itself and must be respected much like one should respect the beautiful nature of these places. As a result, the climbing is often one of commitment, which awards mentally strong climbers with confidence in their onsight skills, since hangdogging is not feasible and top-roping is possible only once somebody has led a route up a certain tower or cliff! It’s undeniable that knowing a local mountain guide helps a lot in making sense of the Czech guidebooks and understanding what routes are best suited to the level of the climber and his/her ability to use slings and knots. We were therefore lucky to have Robin Kaleta with us during our stay. His experience in organising and leading camps for freeride skiers translates very well to rock climbing and thanks to his help we could sign ourselves in the summit diaries of a number of impossibly beautiful sandstone towers. We were also happy to see Adam Ondra in action on this peculiar rock, whose grains of sand seem to be kept together by a magic spell, a spell that also makes them look like anything from limestone tufas to pale granite and even dark volcanic rock. We followed him as he climbed up chimneys, stern cracks, blank faces studded with shallow pockets and smooth arêtes. I mean, we followed him mostly with our eyes, from the ground, conscious that we need to work harder on our climbing! Seeing Adam climb on so many different “terrains” in the space of two days was easily the best possible testimony of the sheer variety of climbing that Adršpach and Teplice offer. This variety regards the actual rock as much as the style dictated by the protections of the routes. 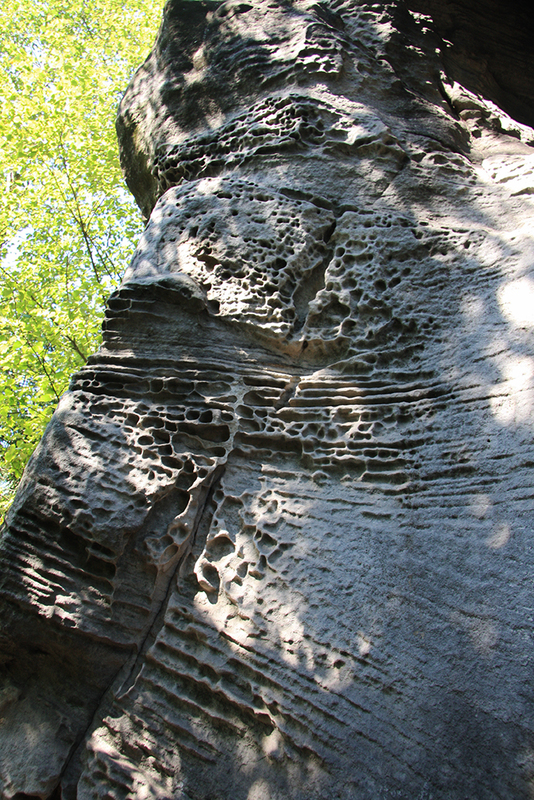 Consequently, it’s possible to literally travel through different climbing eras and really feel the history of this unique places, going from the easiest routes up the towers, on which only knots and slings can be used, to the first routes that had ring bolts to modern, demanding face climbing protected by glue-in bolts. 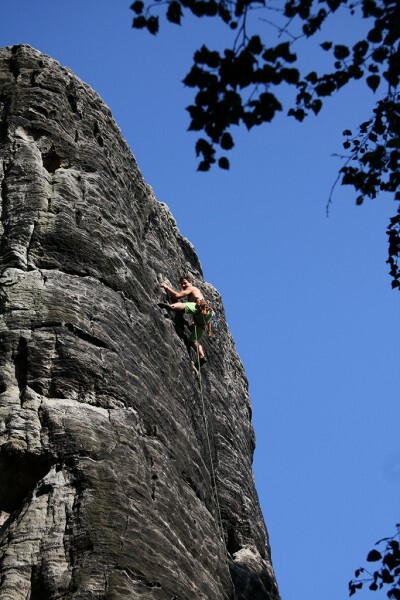 Adam, in this year of focus on competition, what is your approach to rock climbing? How do you live it? As I don’t have that much time and, basically, the only time I have had was this month of travelling with my van between the various competition stages in Europe (Chamonix, Briançon and Imst) my focus is rather on onsighting and having fun. At the same time, outdoor climbing is some kind of mental recovery, partially even physical recovery, after the training I do during the working week. So weekends, when I don’t have university classes, are still outdoors onsighting, which takes less time than projecting. And it makes sense to use that hard-gained shape and fitness for just one serious try. You are a very travelled climber and you regularly climb in crags all over Europe. What does it mean for you to be climbing in your home country, in Czech Republic? For me, climbing in my home climbing area, especially one place, is where I finally get the feeling that I’m at home. I actually feel more at home in this crag than I do in the city where I live because I’ve been going to those rocks since I was very little and we have spent there so many days back then. It’s pretty nostalgic to climb some of the warm-ups I have done hundreds of times. It’s just a nice feeling… You get there through a road which ends there, it’s just one village surrounded by the forest. It’s a calm, nice place. Self-confidence, understanding where your preparation is, knowing how strong you are: how much more difficult is it becoming as time passes? Compare to 5-6 years ago, how is it to manage that mental aspect? Yes, it is difficult. It’s not easy to convince your mind that you are better and better, and that you can climb harder things. That’s getting harder, but at the same time I have more experience and I got to know some tricks better… How to convince my mind that I am stronger, that I am climbing better, that I am better prepared. It’s really important to rationalise things but also to come up with a bit of extra persuasion, a bit of lie you can tell yourself. If your mind believes it and the results follow, it’s all good. But there’s a risk of going for a stupid lie which your mind won’t believe and that won’t make sense. So it goes on a bit like this. I do some hard training, then I climb for a couple of weeks on something initially easier, but the performance must get better with each of these sessions. And it’s important that you get something positive out of every training session, something that was better than the session before. You need to know that you are climbing better than last year. Personally, it’s good to compare on routes I did before. For instance, if there was a crimp that was hard to pull and all of a sudden this year it was easier… that’s what you need! Even just tiny aspects, single moves, can boost your confidence. Which, in turn, is necessary for really hard goals outdoors and even more so in the competition circuit. As we speak, you are fresh from your first Lead World Cup victory this year in Imst. Do you feel like you are finally where you wanted to be with your preparation and focus? When it was time to pull it off and to show how hard I had trained, some things went wrong. In China, I observed the final route and I was pretty sure I would have had good chances to win. I can’t quite say the same of Chamonix, but on the next day, when I didn’t go past qualifications, I felt like I was at my strongest ever. I went to Gravere, in Italy, to onsight the 9a route TCT… and it felt effortless! It was one of those days when you are sure that training as hard as I did really made sense. Yes, but it was more due to technical mistakes which I can easily learn from. It’s hard to be lucky the whole season. I think I was unlucky at the beginning but now it was really important to get a good result on the last World Cup stage before the World Championship in Gijon (Spain) and that’s exactly what I did. Actually, it couldn’t have been better, in a way: I don’t think there are many expectations on me as I’m not leading the World Cup season, there could be more pressure on Jakob (Schubert, the reigning champion) and at the same time I am very motivated, the World Championship is really important to me in this season. And now it’s also good that there is the Boulder World Championship in Munich, which I am going to do in a couple of weeks. I don’t feel any pressure about it. Speaking of which, you did so well at the Innsbruck Boulder World Cup stage, you could have won easily and with three flashes, but, again, just some kind of technical mistake if you wish. Do you think you are better suited to boulder competitions or that you might do well at these forthcoming boulder comps? I can’t speculate on that, because it all depends on the boulders. The boulders in Innsbruck’s final fit me pretty well, and I didn’t find them hard at all. If I had been more aggressive on the third one, if I had thought the final hold was a good one, I might have got it at the second attempt. Can you see yourself doing another Boulder World Cup season, like you did in 2010? I don’t know… Training for boulder competitions is not very motivating for me. They are even more of a lottery compared to lead comps. You can be a somewhat lucky winner, you don’t have to be the strongest at all in order to win, it really depends on the boulder setting. And, by all means, I don’t want to underestimate the performance of strong boulderers, but I just think that bouldering is personally easy compared to lead. Maybe it’s my body type, but I’m naturally strong. Even if I don’t train very hard, I’m still quite strong for bouldering. But if I want to be in a good shape for lead, I really have to train hard. So I might not have picked the right discipline for me, but I do what it’s most motivating for me… On the other hand, I could do bouldering comps more often, they are good fun for me because they’re not as strenuous. But lead is such a good challenge, I really love it. I wouldn’t dare train for boulder as hard as I do for lead. Would you find it risky for injuries? Or for motivation, maybe? Mostly for motivation. If I have this image of lead competitions in my mind during training, it helps me to focus. What are your best memories about these places? 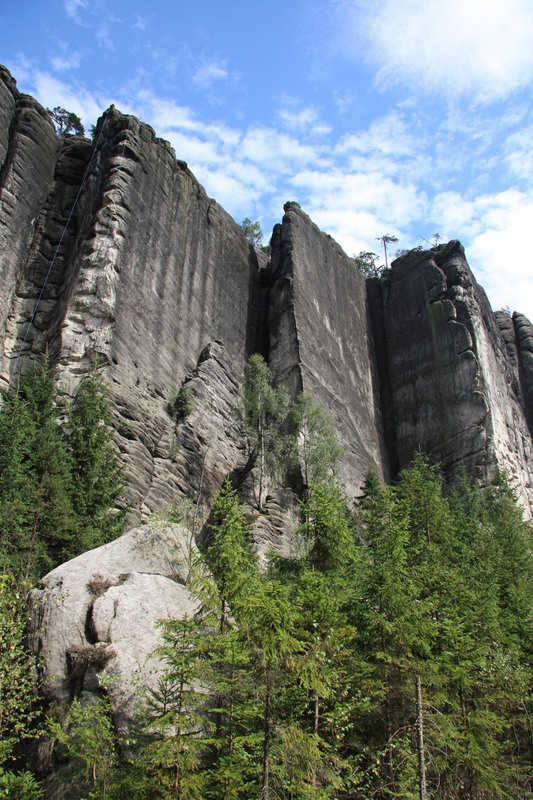 I think I’ve climbed here in Adršpach and Teplice for the first time when I was very little, probably before six. Yet, I still remember something and I know that I’ve always loved it. Compared to the very slippery rock in the Moravian Carst, this was a paradise. And reaching the summits of these towers, signing yourself into the book was so nice. Even if I wasn’t able to write well enough the first time, my father did it for me. It was moments of which I was really proud of, and that’s what stuck to my mind. As I was growing up, I didn’t climbed here very often because at the time lead climbing here was too committing for a child. At the time I would tell my parents “No, I will only lead, I will not follow! Top rope is for beginners!”. So when I got to some other areas of Czech sandstone, when I was 11 or 12, it was like being a foreigner. What else do you like about being here? I really like the good smell of sandstone! Limestone is totally neutral to me. Granite smells bad, especially if it breaks. But sandstone is so good! The towers here are in spruce and pine forests and I think the needles add some kind of spice to the rock and its own smell. Especially after the spring, the smell is more intense than in the summer. There is also very good bouldering close to Adršpach and Teplice, it’s for sure another thing I like about these two places. You drive for 20 km and you get to a huge forest. From there, you have about 30 minutes to the first boulders and some 45 to the best ones. Well, thanks for the interview Adam, it was great talking to you! As our 3-day trip came to an end on Sunday, we wished Adam all the best for the upcoming Bouldering World Championship and, guess what, he won the event, with Czech team mate Martin Stráník making it to the semi-finals too. 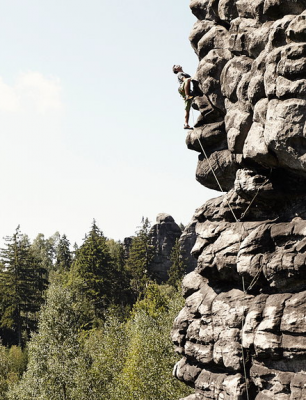 Could climbing on Czech sandstone boulders be an ideal form of training for the big slopers and the balance moves of modern competitions? It’s hard to tell, but for sure bouldering can be a good part of the varied climbing experience in these areas, together with the fascinating city of towers of Adršpach and the spires and walls of the Teplice valley. In conclusion, we would like to thank Adam for inviting us and Robin Kaleta for showing us around. From this September, Robin will begin to organise trips including board, lodging, transportation and guiding to the three top locations for climbing on Czech sandstone: Labak, the so called “Czech Paradise” and of course Adršpach and Teplice. 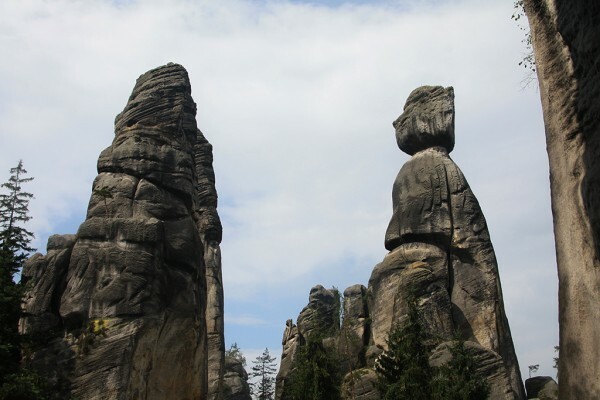 Below is an interesting and uncommon short documentary about Adam bolting ground-up what ended up being the first 9a on Czech sandstone, a route called To tu ještě nebylo and located in Labak. You can see more of Adam taking multiple falls bolting the route, then working on it and sending it here and here. Adam Ondra is sponsored by La Sportiva, Montura, Black Diamond, Beal, Entre-Prises and Hudy. We would like to thank Claudia Ziegler and Jakub Frey for their amazing photos.